Carried off the battlefield with injuries, many warriors’ service ends when their minds and bodies are rendered unfit – no longer a dependable asset for other service members who complete the machine. A space is found in the back of their closet to set their boots aside. And so their service to country ends. 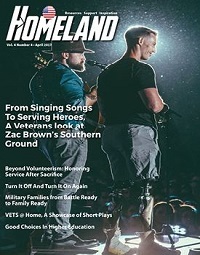 In the April edition of Homeland Magazine, Wounded Warrior Project® National Service Director John Roberts details how a warrior's call to service does not end with service to country.